Bisolvon powder is added to food once or twice daily. It is used in dogs, cats, pigs and cattle. Bisolvon acts to help clear mucus from the respiratory tract and is useful where the accumulation of mucus might be detrimental. This occurs in respiratory infections and some other respiratory diseases. It is possible that Bisolvon increases the concentration of some antibiotics within the mucus when given concurrently, though this has not been proven to be of benefit. White, crystalline powder for oral solution or in-feed use. Each gram contains 10 mg bromhexine hydrochloride. 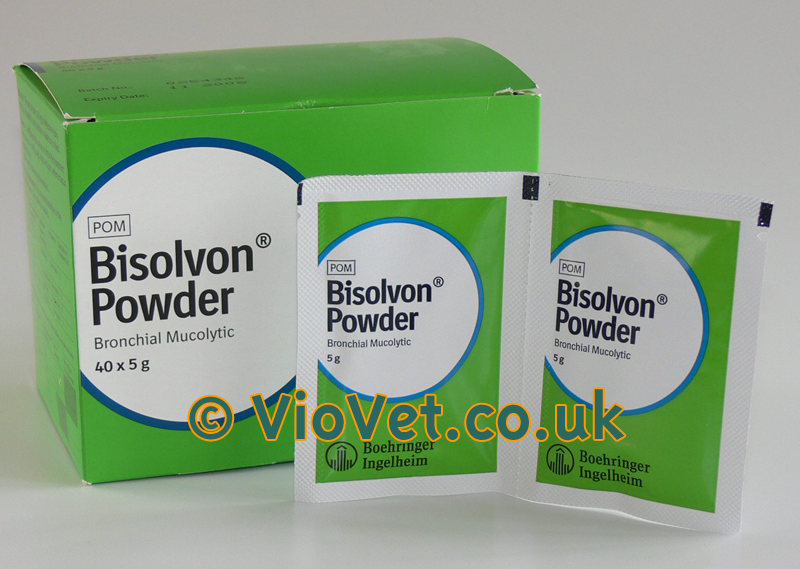 Bisolvon is a mucolytic for use as an aid to the treatment of respiratory disease in cattle, pigs, dogs and cats where mucus is a complicating factor. For oral administration in the feed or drinking water. Add to feed or drinking water immediately before administration. The 500 g and 1 kg pack contains a white measure, delivering approximately 5 g when filled level. The sachet pack contains blue measuring scoops delivering approximately 0.5 g when filled level, suitable for the small animal doses. The following table illustrates the dose to be administered at each treatment (once daily in cattle, pigs and cats and twice daily in dogs) on a per scoop basis. Avoid contact with skin and eyes. In case of accidental eye contact, flush the affected eye with copious amounts of clean running water. Wash hands and exposed skin after administering the product. Not permitted for use in cows producing milk for human consumption. May be used in conjunction with antibiotics and/or sulphonamides, bronchodilators etc. Store below 25°C. Store in a dry place. Keep out of the reach and sight of children. Keep container in outer carton. To be supplied only on a veterinary prescription. For animal treatment only. After opening a sachet, use the contents within a few days and re-seal as well as possible between doses. Any unused material should be discarded within 7 days. Discard any remaining medicated feed or drinking water which is not consumed within 24 hours. Any unused veterinary medicinal product or waste material derived from such veterinary medicinal products should be disposed of in accordance with local requirements. Polyethylene/paper/aluminium foil laminate sachets (heat sealed) containing 5 g powder packed in boxes of 40 sachets with 0.5 g blue polystyrene measuring spoons. Bisolvon is a mucolytic with two main pharmacological actions. Firstly it stimulates an increase in the secretion of fluid by the mucus glands of the respiratory tract. Secondly it breaks down the network of acid glycoprotein fibres found in mucoid sputum, which are mainly responsible for the characteristic viscosity. Bisolvon has been shown to increase mucociliary clearance in calves suffering from respiratory disease. When Bisolvon is administered simultaneously with oxytetracycline in cattle and pigs, the levels of the antibiotic in the bronchial mucus are increased (by more than 40%). The clinical significance of this action is uncertain. Below are some recent questions we've received regarding Bisolvon Oral Powder, including answers from our team. Hi Bisolvon has been very helpful in treating my Persian cat who suffers regularly from blocked nose and sinuses which makes breathing very hard work for her. When asked our vet advised it was possible to keep her on Bisolvon on an ongoing daily basis, which I have done and occasionally I have increased the dose when a bad attack was threatening. She's been on this medication for about 5 months. However the cat also now gets coughing/wheezing attacks most days as if she is trying to clear liquid from throat or lungs. It's just occurred to me that these coughing fits have only started in recent months - so could it be a side effect from the mucolytic? Affecting the viscosity in her chest/throat adversely? My plan is to stop the Bisolvon for a while (unless she gets a bad nasal attack) to see if wheezing attacks improve. It's as if she is trying to bring up a fur ball - and movement will trigger it (eg picking her up). And if I put her back on Bisolvon I will stick to recommended dose. I would welcome your thoughts? Clemmie is not helped by her poor Persian face design so if her nose gets blocked she really struggles to breathe. She is 16 and otherwise healthy. Bisolvon will make the mucus less sticky and easier to cough up. The coughing attacks your cat is having are likely to be helping clear her airways. I would not stop the Bisolvon if your vet has recommended she stays on it. Coughing in my opinion is preferable to struggling to breathe though you should discuss this with your vet if you do decide to stop treatment. Nothing will suddenly make your cat completely better. Bisolvon often helps to clear the airways a little, but it is not very powerful and cat flu is not easy to treat. You have to give the treatment a bit more time perhaps. Otherwise, see your vet again. I would like to know if bisolvon can be used in poultry too? Bisolvon can be used in poultry and is effective. 1 sachet per 10kg bodyweight has been used as a dose, once or twice daily. Always talk to your own vet about this first. Standard withdrawal periods should be followed where applicable.